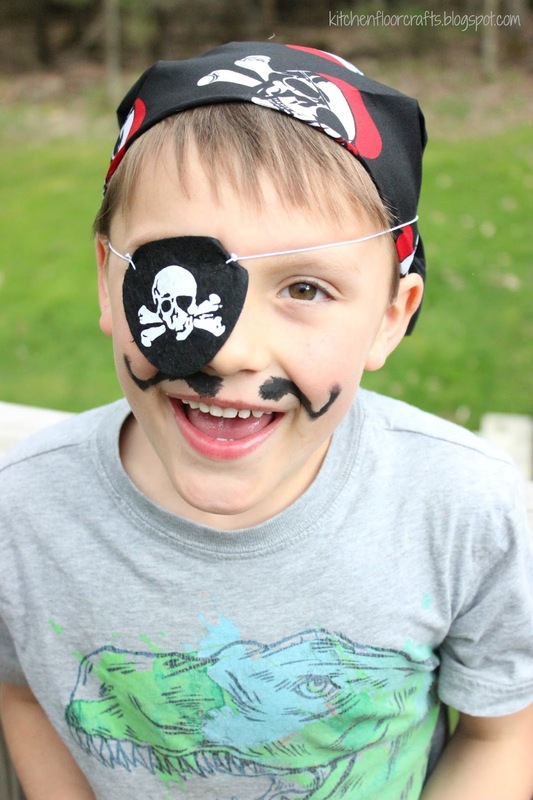 If you've been reading our blog for a while than you know we love all things pirate. It was only a matter of time until one of the boys asked for a pirate themed party. 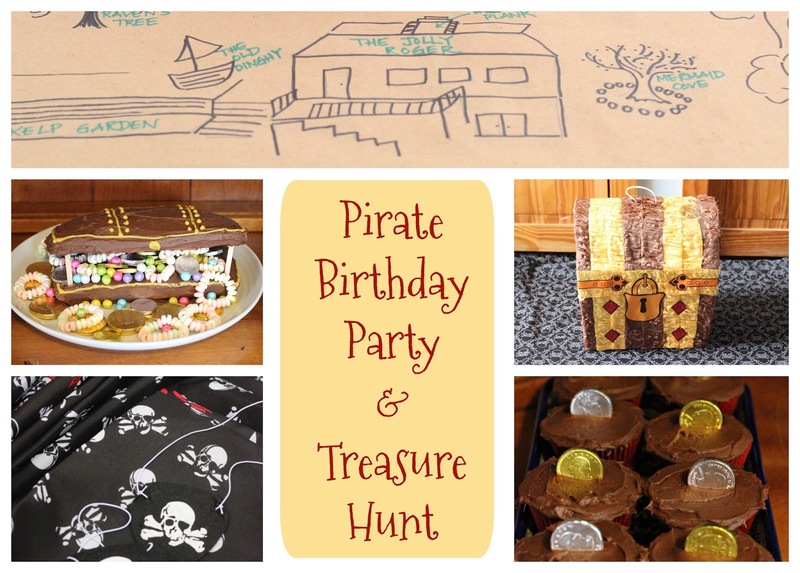 So with Big Brother turning 7 - and asking for a treasure hunt - it was the perfect time for this theme. And of course, we were excited to again team up with The Oriental Trading Company and their awesome party supply resources to create this event! This party took a lot longer to arrive than we originally planned. First, Big Brother wanted it outside, which meant waiting for the snow to melt. Then, everyone in the house got the flu - as did several of the expected party guests - which meant pushing the party out another week. And the day we finally were able to host the party? A pretty mixed weather day with several rainy spells - which made all our plans a little tricky. But despite the delays and the weather - the party was a huge success for both the guests and the birthday guy himself. 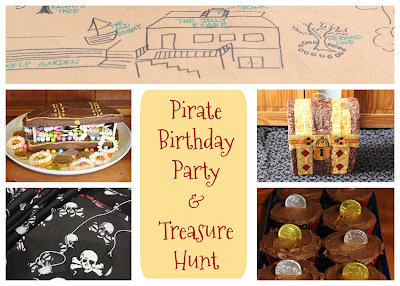 The biggest reason Big Brother wanted a Pirate Party was so that he could have a treasure hunt - which is where we put most of our planning energy. He wanted the treasure hunt to have both a map to follow and a treasure chest to find at the end. 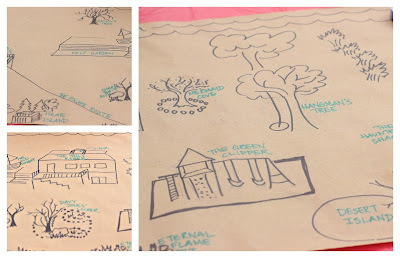 Creating the map was fun as I used brown craft paper and created a quick sketch of our yard. I renamed all the places in our yard with pirate sounding names. We filled the piñata with some great pirate themed favors, mostly from Oriental Trading Company - gold coins, pirate pencils, pirate tattoos, skull and cross bone stampers, plastic jewelry, and a few candies from our local grocery store. Before the party Daddy buried the treasure chest (wrapped in several plastic bags) and I laid some clues out for the kids. 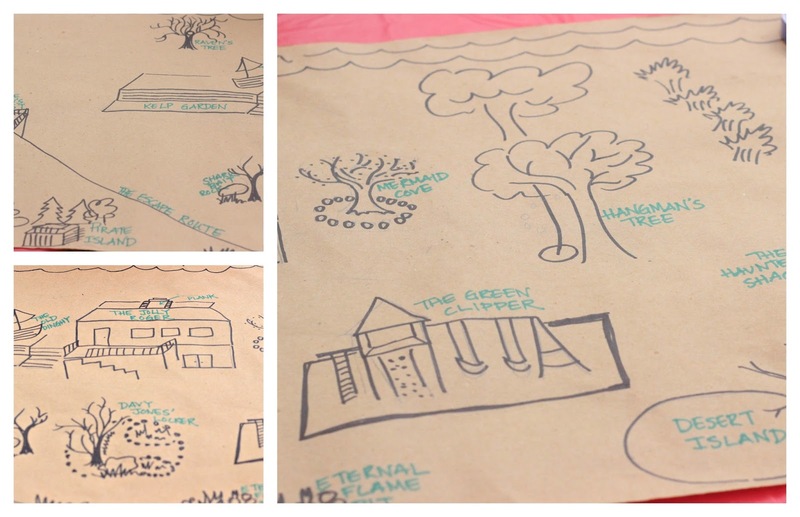 On a small piece of cardboard I wrote the words to where they would find the treasure chest hidden and cut it into 9 pieces. They had to search all the other spots on the map for the clues and put together the puzzle in order to discover that the treasure chest was hidden at "Desert Island." 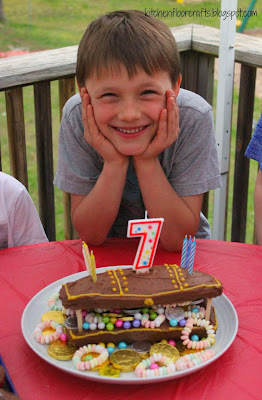 We saved this event for a little later in the party - and it was a huge hit! It also was a great party activity as it lasted for quite a bit- first the hunting for clues using the map, then the actual finding of the treasure, followed up by opening the piñata. When kids got there we just let them free play for a bit, but as this party had mostly 7 year old boys in attendance I knew we would need a few projects to entertain kids. 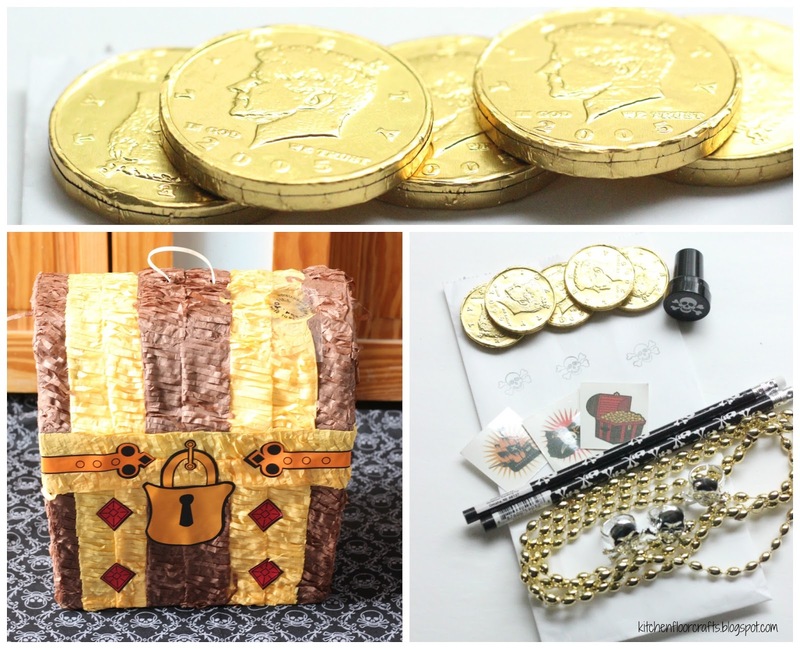 Oriental Trading Company has cardboard treasure chests, which also perfectly fit our party theme. 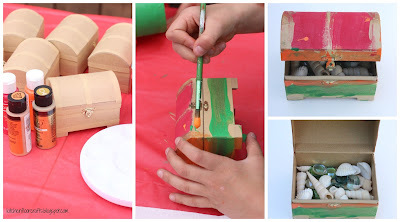 The kiddos painted them with craft acrylic paint. After they dried they filled them with "gems" and seashells we had found at the dollar store. 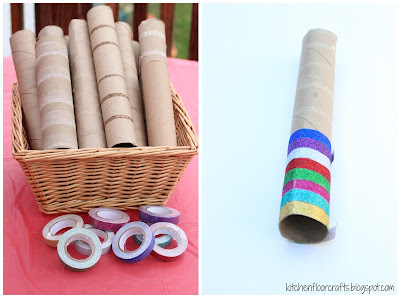 With the help of some coworkers I rounded up several paper towel tubes. Using some sparkly tape from another local dollar store the party guests each decorated their own telescope. I play this game in my classroom. It's a group game where kids need to follow the directions of the "ship captain" and do the motions that match the directions. I had planned we might play the game, except everyone was having so much fun with the Treasure Hunt and other crafts, we didn't need it. But, you can find good directions for "Ship Captain" here. In recent years I've realized that keeping the food as simple as possible and as kid-snack friendly is the best. For birthday parties I like to put out large platters of fruit, veggies, cheese & crackers, and pita chips with hummus . I also add big bowls of pretzels or popcorn. This seems to be the best way to make sure kids actually eat something other than just the sweets. . . . Which of course brings me to the cake. Of course we had to have a treasure chest cake for a pirate themed party! 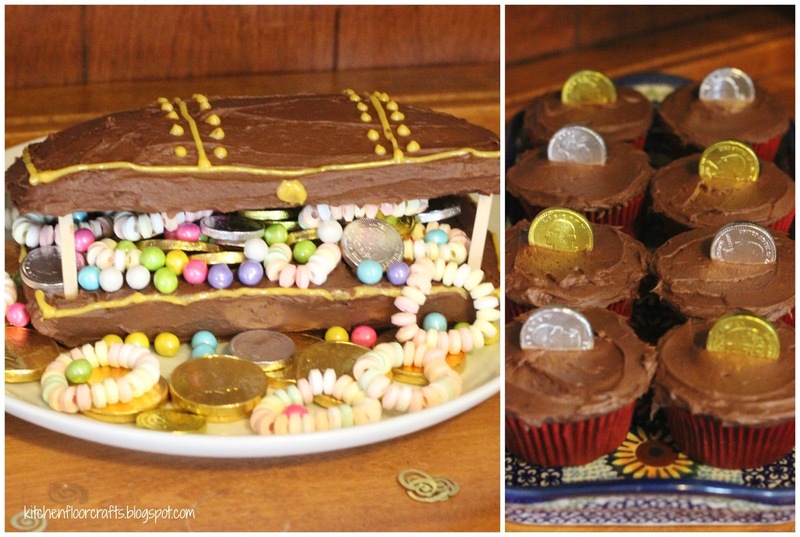 I reused an idea for a cake my mom made years ago - turn a pound cake into a treasure chest. I took a traditional pound cake recipe and baked it as directed. Once it had cooled, I cut the top off evenly. I frosted all the sides with chocolate buttercream frosting. (I use homemade frosting, but you could easily do this with store bought frosting.) 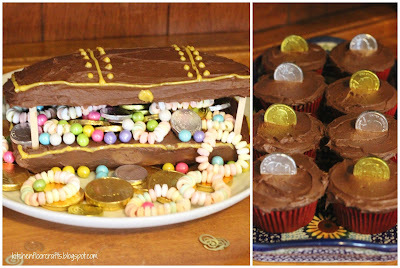 Before placing the top half back onto the bottom, I filled the insides with chocolate coins, candy bracelets, and candy pearls. Because I wasn't sure if all the kids would enjoy the pound cake I also made a quick batch of chocolate cupcakes which I frosted with the rest of the chocolate buttercream frosting. On top of each cupcake I added a chocolate coin. I always feel like the no matter how the birthday party goes - I always want the birthday kiddo themselves enjoy the party. In this case, the birthday guy had a blast. It was definitely a party for the books. 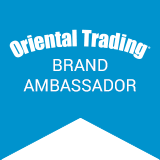 And of course, we couldn't have pulled off such a great party without The Oriental Trading Company all their party resources!